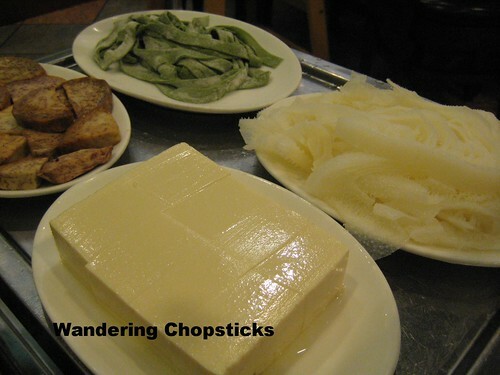 Shortly after I dined at Little Fat Sheep - Monterey Park, the owner divested the franchise, turning several of his locations into Happy Sheep Cafe Shabu & Grill - San Gabriel and Happy Sheep Cafe - Rowland Heights. 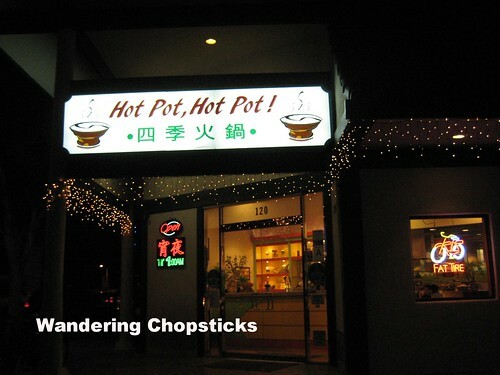 He sold this location to one of the employees, who changed its name to Hot Pot, Hot Pot! So different owner, but same employees. 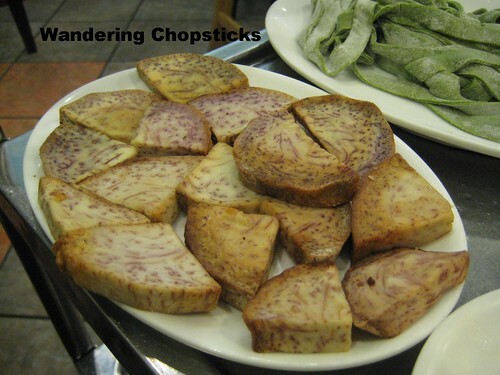 My friend DP and I decided to check it out one night to see if the food quality was the same too. The decor remained the same, including the giant picture of Mongolia with yurts. 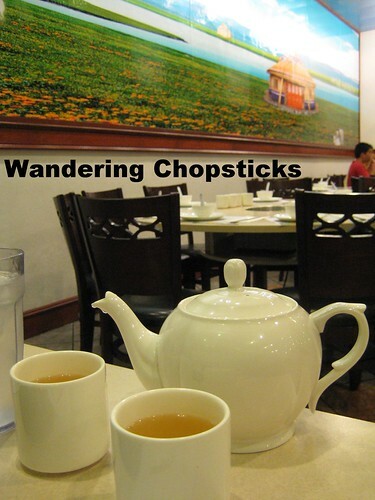 We opted for the half and half broths, the house original Chinese herbal and spicy broths, $3.50 per person. My friend wanted it spicy, even though I told her spicy was spiiicy! 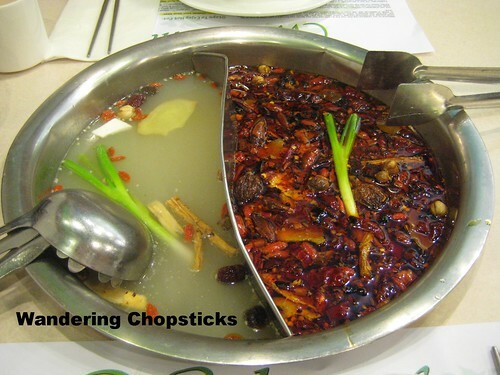 When she saw the sheer amount of dried chilies in the pot, she promptly spooned out the majority of it. I told her it was spicy! 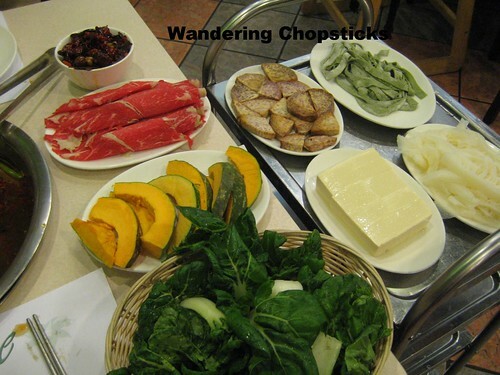 We ordered sliced beef, $4.50; baby bok choy, $2.25; sliced pumpkin, $2.25. 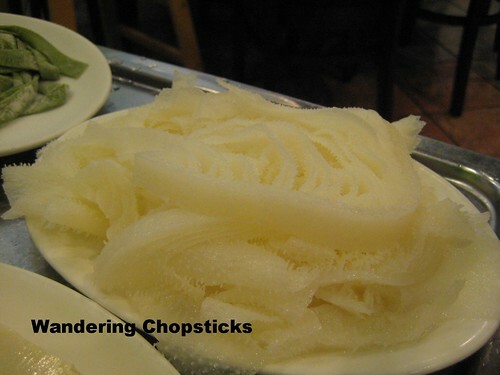 I was going to order the Mongolian noodles, then remembered they were just thick glass noodles. 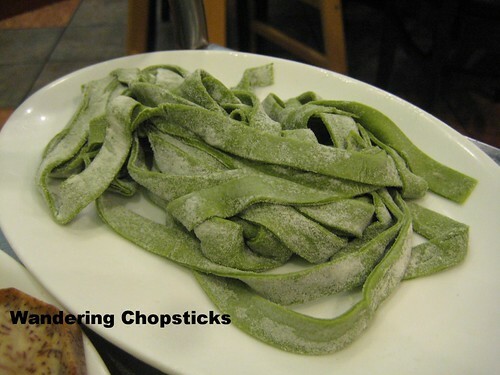 So I opted for the handmade noodles instead, $2.25. 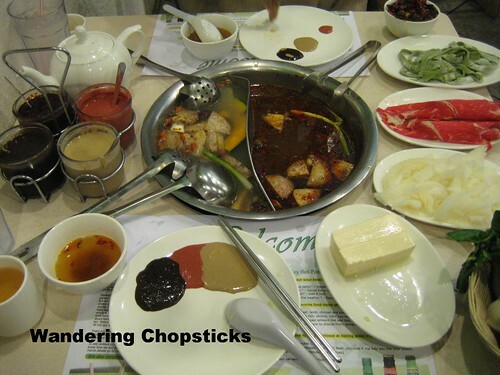 Chili, red and white fermented bean curd, and satay barbecue sauces on the left. Dunk whatever ingredient you wish into whichever pot of broth you wish. Use the ladle if you want soup, or the slotted spoon if you just want to dip the ingredients. After tax and tip, the bill was a little over $30 for the two of us. 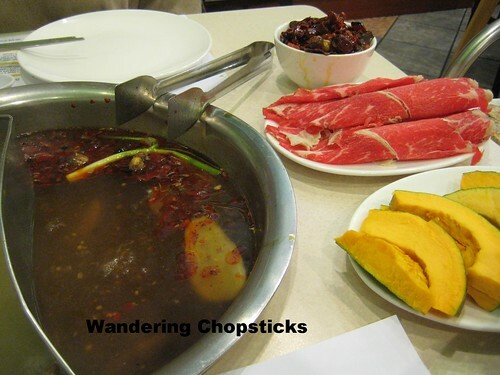 Unless you're a big eater or order expensive ingredients, I usually average around $20 for hot pot. So even though the name might have changed, the cleanliness and quality of Little Fat Sheep remains. 1 year ago today, Kee Wah Bakery - Monterey Park. 2 years ago today, I was nominated for a Foodbuzz blog award. 3 years ago today, Hwa Ro Korean BBQ & Tofu - San Gabriel (Closed). 4 years ago today, Grilled Cheese Sandwich.